Those participants who are eighteen years old who have not attended college will be eligible to compete. Tournament entry fees can not be accepted on-site. NEW: A Player will compete in the age division based on his/her age as of May 15, 2019. 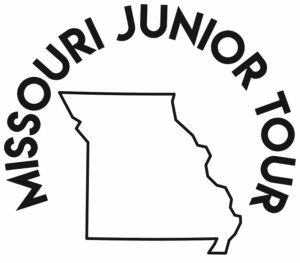 This date will determine his/her age division placement for the entire 2019 Missouri Junior Tour Season. You may request to Play Up. See link above. At some courses, carts are mandatory and the associated fees will be required. Juniors must have a valid driver’s license or be accompanied by a parent. Proper golf attire required on all courses and at all times. (Shirts with a collar, no T-shirts, no cut-offs, no swim trunks and soft spikes only). Individual golf facilities have the right to restrict or revoke program card usage at any time. Special discounts are for junior golf privilege program members only and parents where specified on card. Membership cards will be available at the first event, or the MJGF will mail them to the player. MJT will email the tee times to the players. All players must keep up with the group ahead of them, repair ball marks and replace divots. Local rule sheet will be provided at each tournament site. CHEATING will immediately disqualify a participant from the competition and all tournaments left in the series. Any prepayment will be forfeited. penalties, disqualification or may disqualify a participant from all tournaments left in the series. We expect all players to register for events by the deadline date and adhere to the cancellation policy. 1st = 35 pts. 2nd = 25 pts. 3rd = 20 pts. 4th = 15 pts. 5th = 14 pts. 6th = 12 pts. 7th = 11 pts. 8th = 10 pts. 9th = 9 pts. The points will be updated after each event. All ties will split. There is not a minimum of events the competitor has to play in to qualify for the Tour Championship. However, only 5 events will be counted in the season point standings. If the participant plays all 8 events the 5 highest point totals from his/her events will be used for the point total. Any ties at the end of the year will be broken by 1) Most 1st place finishes. 2) Most events played. 3) Most top 5 finishes. Following play there will be a cook out and pool party along with the Scholarship Awards. Withdraw Policy: Contact the MGA by phone at 573-636-8994 NO cancellations will be accepted after 5:00 p.m., two days prior to the tournament. Players who withdraw in accordance with this policy will be given a refund MINUS THE ADMIN FEE OF $2 FOR $15 entry fee AND $5 FOR $30 entry fee. (2018) You can withdraw from a maximum of two events per child. Players who do not withdraw in accordance with this policy will lose their entry fee(s). Following our championship on Monday we will host our annual awards banquet. All scholarship recipients, series championship participants and parents will be invited. More detailed information will follow as arrangements are confirmed. Please plan on attending to celebrate are scholarship recipients and series championship players.